Chief Mark Saunders says that Homicide investigators will continue their exhaustive efforts to solve the murders of Barry and Honey Sherman. “We all have the same objective. At the end of the day we want to bring those people responsible for this… before the judicial system. That’s something we’ll continue to make every effort to move toward,” the Chief told the media at police headquarters on Oct. 26. During the investigation so far, there have been 50 officers involved in the case, 39 judicial authorizations, 4,000 typed pages of documents prepared, a forensic examination of the house that lasted over six weeks, 200 witnesses interviewed and 2,000 hours of security video were retrieved. The couple were found dead on December 14, 2017 in their home, hanging by belts from an indoor poolside railing. Chief Saunders says Homicide investigators will continue to work with the Sherman family and their lawyer to share information and exhibits. He also supported the issuance of a reward in the case. He appealed to anyone with information is asked to call investigators at 416-808-7400. Chief Saunders noted investigators never reached a premature conclusion in the case and never stated the case may have been a murder-suicide. Local investigators, who had been investigating a rash of break-and-enters at the time, only sought to reassure the public that there was no sign that this was a break-and-enter or robbery that escalated into violence. It was a suspicious death investigation right from the start. The Centre for Forensic Sciences and Ministry of the Attorney General have also worked in partnership with the Toronto Police Service throughout the case. Chief Saunders noted that Ontario Court Justice Leslie Pringle, who has read and ruled on the police warrants has found no fault in the investigation. He says Toronto Homicide investigators have his full confidence. 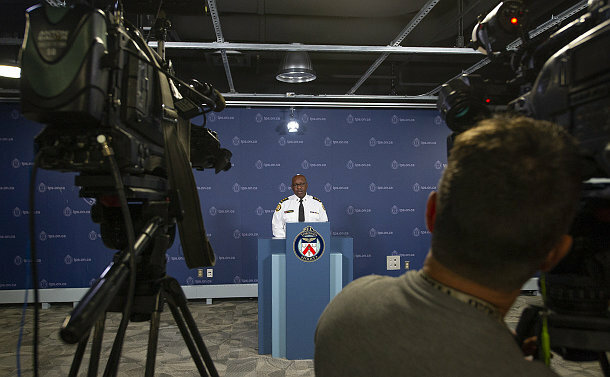 The Toronto Police Services Board issued a statement in support of the ongoing investigation. “The Board has full confidence in the Chief’s oversight of this investigation, including the Toronto Police Service’s ability to ultimately identify the perpetrators,” it reads.